A doctor should be seen if a person has shortness of breath, pain in the chest, or pain or swelling in the abdomen. If there are symptoms, the doctor may order an x-ray of the chest or abdomen. The doctor may look inside the chest cavity with a special instrument called a thoracoscope. A cut will be made through the chest wall and the thoracoscope will be put into the chest between two ribs. This test, called thoracoscopy, is usually done in the hospital. Before the test, the patient will be given a local anesthetic (a drug that causes a loss of feeling for a short period of time). Some pressure may be felt, but usually there is no pain. The doctor may also look inside the abdomen (peritoneoscopy) with a special tool called a peritoneoscope. The peritoneoscope is put into an opening made in the abdomen. This test is also usually done in the hospital. Before the test is done, a local anesthetic will be given. If tissue that is not normal is found, the doctor will need to cut out a small piece and have it looked at under a microscope to see if there are any cancer cells. This is called a biopsy. Biopsies are usually done during the thoracoscopy or peritoneoscopy. The chance of recovery (prognosis) depends on the size of the cancer, where the cancer is, how far the cancer has spread, how the cancer cells look under the microscope, how the cancer responds to treatment, and the patient's age. Once malignant mesothelioma is found, more tests will be done to find out if cancer cells have spread to other parts of the body. This is called staging. A doctor needs to know the stage of the cancer to plan treatment. The following stages are used for malignant mesothelioma. Stage I: The cancer is found in the lining of the chest cavity near the lung and heart or in the diaphragm or the lung. Stage II: The cancer has spread beyond the lining of the chest to lymph nodes in the chest. Stage III: Cancer has spread into the chest wall, center of the chest, heart, through the diaphragm, or abdominal lining, and in some cases into nearby lymph nodes. Recurrent disease means that the cancer has come back (recurred) after it has been treated. It may come back in the lining of the chest or abdomen or in another part of the body. Surgery is a common treatment of malignant mesothelioma. The doctor may remove part of the lining of the chest or abdomen and some of the tissue around it. Depending on how far the cancer has spread, a lung also may be removed in an operation called a pneumonectomy. Sometimes part of the diaphragm, the muscle below the lungs that helps with breathing, is also removed. Radiation therapy uses high-energy x-rays to kill cancer cells and shrink tumors. Radiation may come from a machine outside the body (external radiation therapy) or from putting materials that produce radiation (radioisotopes) through thin plastic tubes in the area where the cancer cells are found (internal radiation therapy). If fluid has collected in the chest or abdomen, the doctor may drain the fluid out of the body by putting a needle into the chest or abdomen and using gentle suction to remove the fluid. If fluid is removed from the chest, this is called thoracentesis. If fluid is removed from the abdomen, this is called paracentesis. The doctor may also put drugs through a tube into the chest to prevent more fluid from accumulating. Chemotherapy uses drugs to kill cancer cells. Chemotherapy may be taken by pill, or it may be put into the body by a needle in the vein or muscle. Chemotherapy is called a systemic treatment because the drug enters the bloodstream, travels through the body, and can kill cancer cells throughout the body. In mesothelioma, chemotherapy may be put directly into the chest (intrapleural chemotherapy). Intraoperative photodynamic therapy is a new type of treatment that uses special drugs and light to kill cancer cells during surgery. A drug that makes cancer cells more sensitive to light is injected into a vein several days before surgery. During surgery to remove as much of the cancer as possible, a special light is used to shine on the pleura. This treatment is being studied for early stages of mesothelioma in the chest. Treatment depends on where the cancer is, how far it has spread, and the patient's age and general health. Standard treatment may be considered because of its effectiveness in patients in past studies, or participation in a clinical trial may be considered. Not all patients are cured with standard therapy and some standard treatments may have more side effects than are desired. For these reasons, clinical trials are designed to find better ways to treat cancer patients and are based on the most up-to-date information. 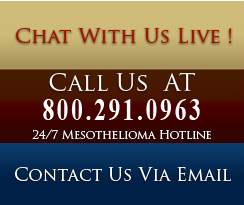 Clinical trials are ongoing in many parts of the country for many patients with malignant mesothelioma. To learn more about clinical trials, call the Cancer Information Service at 1-800-4-CANCER (1-800-422-6237); TTY at 1-800-332-8615. If the cancer is only in one place in the chest or abdomen, treatment will probably be surgery to remove part of the pleura and some of the tissue around it. 1. Surgery to remove the pleura and the tissue near it to relieve symptoms, with or without radiation therapy after surgery. 2. Surgery to remove sections of the pleura, the lung, part of the diaphragm, and part of the lining around the heart. 3. External beam radiation therapy to relieve symptoms. 4. A clinical trial of surgery followed by chemotherapy given inside the chest. 5. A clinical trial of surgery, radiation therapy, and/or chemotherapy. Draining of fluid in the chest or abdomen (thoracentesis or paracentesis) to reduce discomfort. Drugs also may be put into the chest or abdomen to prevent further collection of fluid. Radiation therapy to relieve symptoms. A clinical trial of surgery, radiation therapy, and chemotherapy. Chemotherapy given in the chest or abdomen.